Hi I'm Anya. 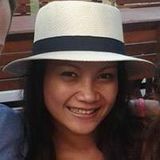 I was born and raised in Hua Hin Thailand and moved to Sydney Australia when I was 19. I have a passion for growing and eating good food and love to teach people about Thai food and the ingredients used. Trips created by Anya Y.